Can you drink too much seltzer? Here's everything you need to know. Sparkling water can be a great calorie- and sugar-free alternative to soda, but there may be a few reasons to drink it in moderation. When I quit soda a decade ago, I coped by drinking seltzer water with juice. It gave me the sugary fix along with the carbonated rush. Gradually, I removed the fruit juice and opted for the seltzer solo. Over the following three months, I lost at least five pounds and found that my complexion and energy levels had improved. Perhaps this had to do not only with the elimination of all the sugar and sodium I was ingesting with all that ginger ale, but with the amount of water (albeit carbonated) that I had replaced it with. I was downright chugging the stuff all day. A decade later, I’ve upped my plain water consumption, but come meal times, I’m still hooked on seltzer (typically unflavored, with a wedge of lemon). I probably drink it now more than ever since I quit alcohol (a choice that resulted in shedding another five pounds) and have made seltzer with a splash of cranberry juice my standard order at bars. But, like with all things that seem too good to be true, I have worries about the possible cons of seltzer. I’ve heard that it can ruin your enamel, disrupt digestion and be less hydrating than regular water, for which I often substitute it. Fueled by my own anxieties about what the heck I’m actually drinking, and hopeful to get the facts straight, I turned to certified nutritionists, registered dietitians and a dentist to explain exactly what seltzer is and what it means for our health. Because of the sodium content, you might want to avoid club soda (and definitely check with a doctor if you have any underlying health issues that call for restricted sodium). “People who are salt-sensitive or being mindful of added salt in their overall diet should be aware of the difference and make an educated choice,” says Maya Feller, MS, RD, CDN of Maya Feller Nutrition, a registered dietitian nutritionist. Good news for us seltzer lovers, this magical tonic (a bit hyperbolic, sure, but certainly how I feel about it) has the same hydrating benefits as plain water — if you drink it plain. Plain seltzer without additional additives can be as hydrating as water. From my own experience drinking seltzer in a Pilates class today, I don’t recommend it. The seltzer made me feel like burping and threw off my breathing flow. 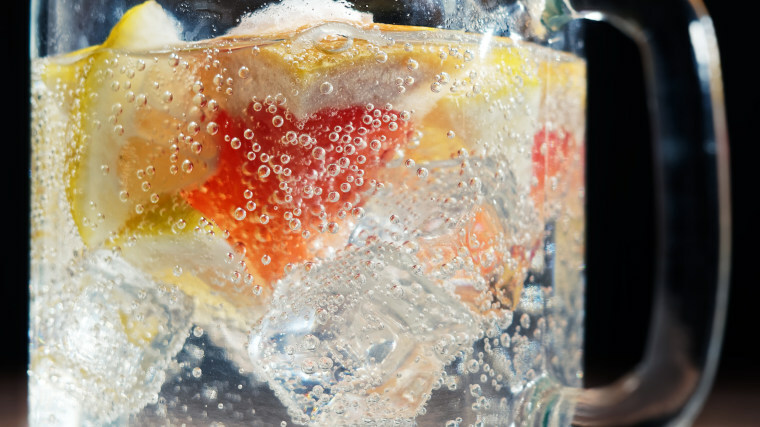 Seltzer is indeed, harsh on your teeth, but not if you drink it right (and in moderation). Over time, that acidity can lead to enamel erosion. Grause also recommends using a straw if you want to be “extra careful”, as this allows the seltzer to bypass your teeth. Might I add that these are all foods I eat in great quantity, so I certainly need to cut down. I also have IBS, and the carbonation in seltzer can cause further irritation. People who have IBS and or a sensitive GI may want to steer clear of carbonated water. “Also, if a person is using it to fill up and intentionally skip multiple meals/snacks then that is too much because every skipped meals/snacks are missed opportunities to fuel the body with nutrient dense foods,” says Marinucci. Reading labels is always wise, but with seltzer — in particular flavored seltzer — it can be tricky to know exactly what you’re getting. The term “natural flavor” has been a hot debate, with even the FDA calling for more transparency, given that the labeling is vague at best, and doesn’t illuminate the processes that may be involved. Seltzer brands like La Croix, which famously touts no calories, artificial sweeteners or sodium says its flavors are “derived from the natural essence oils extracted from the named fruit” boasted on the can. How exactly this happens is a proprietary mystery. No disrespect to La Croix here (that grapefruit one is my best friend at barbecues, and I love that it’s not too fizzy or too sweet), but if you want to know exactly what’s in your seltzer, make your own at home (I use a SodaStream, but there are other kits out there). In any event, seltzer is absolutely the best sparkling beverage choice, especially if you’re watching calories or looking to up your hydration.